In the late 1980's Britain was inflicted with a mad cow epidemic also known by its scientific term: bovine spongiform encephalopathy. Given that the disease is highly contiguous, incurable, and unfortunately deadly, the effects of the outbreak in the 1980's was devastating. The cause of this outbreak was found within very small protein particles called prions. 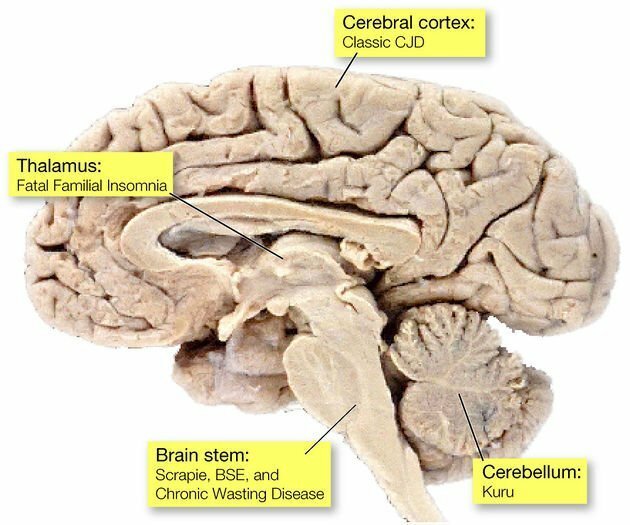 Transmissible spongiform encephalopathies (TSE) are diseases that generally affect the brain and are caused by prions. The term prion was coined to mean proteinaceous infectious particle . Prions are protein particles called proviruses and are composed of ordinary protein. Prions don't possess any cellular structure but are highly infectious and transmissible. Prion diseases are caused by misfolded forms of the prion protein, also known as PrP. PrP is a protein that every mammal has in their bodies. In humans, chromosome 20 contains information for the creation of PrP by each cell in the body. These normal PrP are termed cellular prion protein (PrPC). PrPC become abnormal proteins when they refold themselves into abnormal proteins. For example, a normal PrPC is capable of folding itself into an abnormal protein such as PrPSC which causes scrapie, a neurological disorder in sheep. Abnormal PrP is so devastating to humans and animals because they are capable or replicating so quickly and in very large numbers. Replication is one of the defining characteristics of living organisms as well as energy production, transferable genetic material and anabolic and catabolic activities. Viruses do not produce energy, or necessitate metabolism, but have genetic material, and undeniably can replicate. Similarly, prions do not provide or even use energy, and yet, are able to replicate themselves by converting other proteins to prions multiplying their population. In addition to multiplying in numbers, prions are suggested to be primordial evolutionary viruses or even enzymes. Either by hereditary or sporadic methods, the coding region for any protein in genetic material (DNA) can be altered in various ways over time (evolution). In the case of prions, their coding sequence has altered through evolution and they have gained the ability to transform other proper proteins into prions. 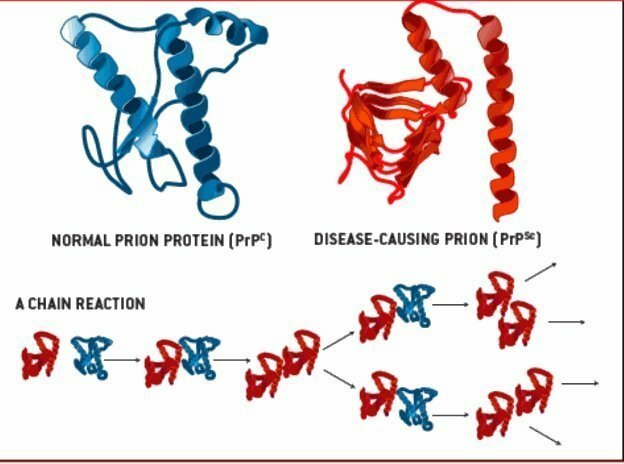 Prions can also convert other proper proteins into prions. Prions can also evade degradation. Degradation is a safe check system for any living organism. Any substances that are produced in cells, must be available for degradation (breaking down into smaller pieces). The process ensures that none of the cell product will pile up in the cell and create a burden for it. Molecules which are assigned to stay within the limit of the cell should have added features to degradation. 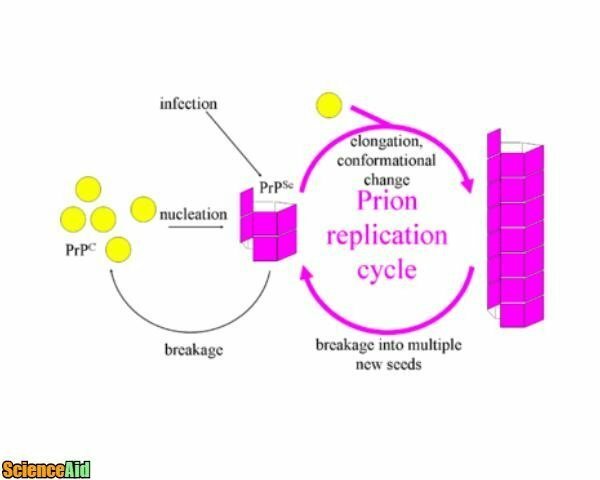 As prions are resistant to degradation; their population is always steadily on the rise, which creates a self-feeding loop. Fatal Familial Insomnia. A very rare brain disease. Kuru. A very rare neurological disease that primarily affects the Fore people of New Guinea. Scrapie. A fatal disease that affects the neurological system of sheep. Creutzfeldt-Jakob Disease (CJD). A rare but fatal brain disease. Gertsmann-Straussler-Scheinker syndrome (GSS). A fatal degenerative disease in humans. As you can tell from the list, most Prions affect nervous system tissues, however, prions can affect extraneural tissue including the spleen and lymph nodes. 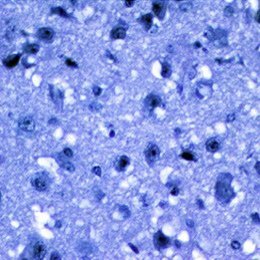 Scientists are not sure why most diseases caused by prions are neurological. When prions access the brain, they alter and disable essential proteins in the brain, then destroy them creating holes resembling a sponge, hence the name, spongiform. The first symptoms are variable from dementia to mild shaking, but as the disease progresses, hallucinations and insomnia are present, which combined with the loss of weight and a fatal amount of brain tissue, death is unavoidable. There is still no cure for TSE diseases. One reason is that the nervous system, and especially the brain are able to protect itself from detrimental substances. Most medical drugs used as treatment are unable to penetrate the brain tissue. Ongoing research and enhanced brain-penetrating drugs and scientists are close to finding successful interventions for TSE conditions in humans and animals. MLA (Modern Language Association) "Diseases Caused By Protein: Prions." 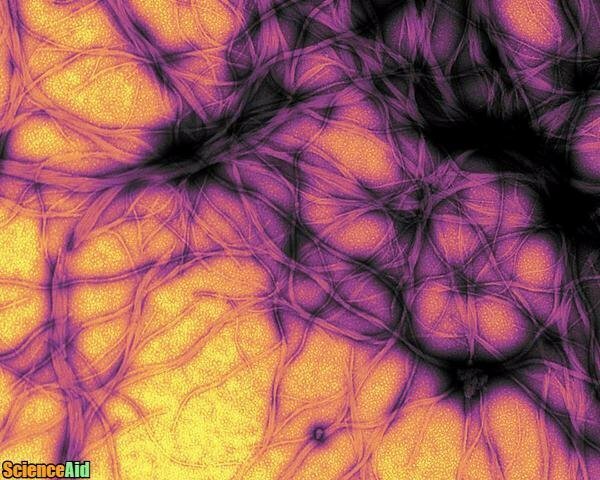 ScienceAid, scienceaid.net/Prions;_Proteins_That_Act_Like_Viruses Accessed 20 Apr 2019. Chicago / Turabian ScienceAid.net. "Diseases Caused By Protein: Prions." Accessed Apr 20, 2019. https://scienceaid.net/Prions;_Proteins_That_Act_Like_Viruses. Thanks to all authors for creating a page that has been read 597 times.